PRIOR to any repairs, you, the customer, MUST contact DME Auto Service FIRST. The vehicle must be brought back to DME Auto Service for any warranty repairs. The warranty repair of the vehicle described is subject to the availability of labor and parts. DME Auto Service is not responsible for the unavailability of parts or delays in parts shipments beyond the repair facility’s control. At the sole discretion of DME Auto Service, any warranty reimbursement will be limited up to the amount of the original service/repair performed by DME Auto Service. 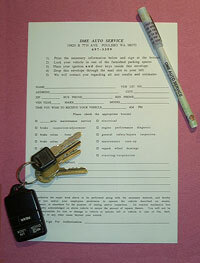 Although it is unfortunate that a failure may have occurred with your vehicle, DME Auto Service will not be responsible for any towing expenses, diagnostic charges, rental car expenses, lodging expenses, meal expenses, loss of use, loss of earnings, per diem expenses, nor any other expense the customer may incur or claims of any nature whatsoever. No warranty, neither written, expressed, nor implied will be offered on used parts and labor or customer supplied parts and labor. This document may not be reproduced in any manner without the expressed written permission of the author. Reprint or reproduction in any form is strictly prohibited.